Last month at the local Los Angeles revival theater the New Beverly Cinema, Alex Winter introduced a double feature of Bill & Ted's Excellent Adventure and Bill & Ted's Bogus Journey. In between the two films, Julia Marchese moderated a Q&A where Mr. Winter told the crowd that both he and Keanu Reeves have always talked about doing a third film in the series. The biggest hitch between both of them and making a third movie, is it has to be done right. Alex Winter received a ton of positive feedback to the idea of a third movie when the sold out event erupted with applause at the notion. 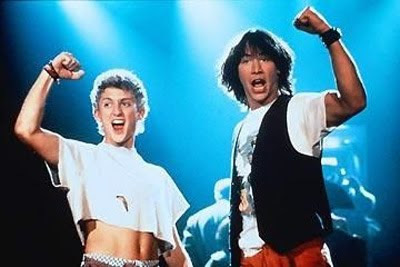 Perhaps that seed of excitement began to grow in Mr. Winter's mind (and others) because recently Keanu Reeves was asked about the possibility of a another Bill & Ted's adventure and it is clear from the reaction on his face and his words that he really wants to do it. Take a look at the interview below. While most of this is speculation, I'd like to think the warm response Alex Winter received from me and the rest of the New Beverly crowd last month got the creative ball rolling again between Keanu Reeves and Alex Winter. You can see from the above interview that Keanu mentions the Beverly Q&A in Los Angeles and he seems genuinely thrilled at the idea. I'd love to see a third film, but the best part is knowing that Winter and Reeves won't bother just making another a sequel just to make it. As Keanu Reeves said, it has to be a film "that can stand up on its own." Whether in 2014 will see a third Bill & Ted's film is still up in the air, but after some recent appreciation, perhaps Wyld Stallions just must come back for a reunion tour! Stay tuned for anything concerning Bill & Ted.